Like the majority of all newly constructed electrical-electronical cylinder phonographs, this device works with a counterbalanced light tone arm and a low-pressure cartridge, which enables it to play even the most delicate cylinders without adding any perceptible wear. Given the fact, that there are many formats of cylinders, the initial idea was to build a machine that should be able to play all of the cylinder sizes that are likely to appear sooner or later in the field of vision of a common European collector. These are: Standard, (Blue) Amberol, Grand, Inter, Busy Bee, Phénix, Lioret 1-3, Lioret Eurêka; all in all 10 different formats. Some of them are damageable and shouldn’t be played on vintage machines any more, others, like the Liorets, are robust, but usually require special and extremely rare original phonographs to play them. The electric phonograph gets along with all sizes mentioned above. To be honest: hitherto the machine never played grand and Busy Bee cylinders, but it could easily be transformed to do so. The central element of the apparatus is an original Edison conversion kit with a standard mandrel and planet-geared feedscrew with feednut, once sold to amberolize Triumph A and B machines. Integrated into an appropriate, newly constructed upper works, this kit can be used to play the two most common sizes Standard and Amberol. In addition, the upper works’ construction leaves enough free space around the standard mandrel for the application of slip-on-mandrels for cylinders of larger diameter up to the grand format. To allow longer sizes to be played, the conversion kit has been fitted with a ball bearing being a second mount between feedscrew and mandrel. As a result the thin end of the mandrel doesn’t need any further mounting, thus ending freely. This enables to plug on a special mount, constructed of elastic ashwood and felt to hold and adjust the Lioret-sizes 1-3. To bring the tonearm in reach of this mandrel attachment, the entire carriage can be loosened, shifted to the right side and fixed again in the appropriate position. By a lifting / lowering mechanism with a lever, the feeding and tonearm unit can be positioned precisely and lowered smoothly on any section of the cylinder groove. Presently, the cartridge in use is an Ortofon 78. To play standard grooves, it is fitted with a perfectly rounded, self-made borosilicate glass tip, 0,15 mm in diameter. All 4 min cylinders and Lioret celluloid cylinders can be played with the original Ortofon 78 sapphire stylus. The output signal can be connected directly to the computer input for unamplified digitization or to a preamplifier or mixer for analog amplification. 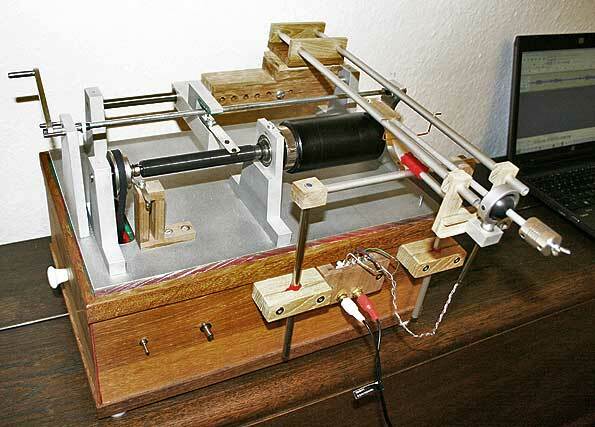 The phonograph is driven by a digitally controlled 45 W step motor with a self-made 10:1 gearing. This device and a rubber-coated and welded driving belt provide perfect reliability of any speed between 60 and 250 RPM. Without the kind help of two engineers, who supplied the regulated step motor and the machined aluminum upper work parts, I’d never have managed to build this very well and reliably working machine.